This just in from Titan Publishing: the cover for (and more details of) issue #2 of their amazing Transformers comic/magazine. Click on the link for the image. It’s out on August 16th, comes with FREE Transformers tattoos, and features an all-new (movie-based) strip by me and artist Nick Roche, featuring Megatron! What more could you ask for? Check out the TF-UK MySpace page here for more details. Phew. That San Diego Comicon! It just gets bigger and badder (in the best possible way). Three of the four days sold out. The entire cavernous convention hall packed with exhibitors, professionals and fans. A simply staggering array of mercandise and talent. It really has to be seen to be believed. This was maybe my fourth Comicon, and each time it just seems to be more overwhelming than the last. Hard to see how it can get any bigger, but you feel it will… somehow. Anyway, I tipped up at Comicon on the Friday AM, having skipped the Thursday (I was still in L.A.) entirely. I spent the morning touching base with as many people as possible, including Richard Starkings (former Marvel UK editor and current publisher of Elephantmen), Don Hudson & Steve Buccellato (fellow comic creators), Sven Larsen (formerly of Marvel US and the current driving force behind comics publisher Teshkeel), Josh Izzo (of Hasbro), Titan Publishing (who had their own stand for, I believe, the first time), the guys at IDW and probably many others I’ve forgotten in the general mayhem of that first morning. Then it was on to the DK (Dorling Kindersley) stand for my first official duty, a one-hour signing (of the updated Transformers The Ultimate Guide, You Can Draw Transformers and Transformers The Movie Guide). DK were kind of wedged between mighty Lucasfilm and Hasbro, so there was a good amount of foot traffic and interest in the books. It was heartening to see a whole lot of kids among those hugely excited about all things Transformers. DK’s Bess Braswell and Susan Stockman made sure everything ran smoothly for this and subsequent signings, which made my life that much easier. Thanks to both. That done, I did some serious investigation of the publishers in attendance, seeking out those I wished to meet and speak to about a (giant robot-free) project of my own. Some I knew to seek out, others I kind of stumbled across. Should anything come of this, I’ll of course share the details with you here. If nothing else, I made some very useful contacts. By around 4PM I was kind of done for the day, and headed for the relative sanity of the Marriott bar and a drink Sven Larsen. The convention hall is huge, and progress around it for any length of time exhausting. A margerita never tasted so good. That evening, a bunch of us (including Sven, Rob Tokar and Kevin Carr) went out for food and the inevitable post-Con drinks at the Hyatt bar (the preferred hang-out of professionals and fans alike). I was exhausted, and yet this was merely the warm-up as far as I was concerned. Saturday was set to be pretty much wall-to-wall signings and panels. Would I even make it to Sunday? If you can bear the suspense, I’ll be back with more ‘post-Comicon ponderings’ soon, plus (as soon as I get home and download them) pictures. Lots of Transformers tidbits to come, some of which have been reported, others that haven’t!! *Nick Roche is going to be in Belfast this weekend, appearing at an exhibition of his artwork. He’ll also be running through the script-to-art presentation (wherein Nick draws a new Transformer, live on stage, with audience participation, in, like, no time) we put together for a previous Belfast gig. For more information, go here. *Titan have updated their Transformers magazine MySpace page with details of the London Comicon appearance/signing I’m doing with Steve White and Geoff Senior as well as all you need to know about a very special competition they’ll be running on the day. That’s about it for now. Join me again post-San Diego for a round-up of everything that’s fit to print (and stuff that’s not). Cheers! 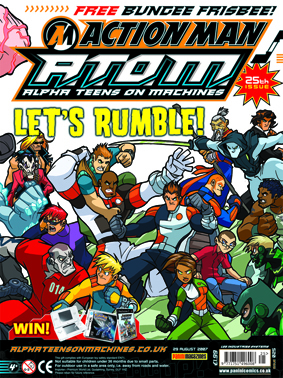 Out now, in stores, ready for reader consumption, is A.T.O.M (Alpha Teens on Machines) issue #25, which features (of course, as we’re talking about it here) an all-new comic strip written by me (oh, and drawn by that Jack Lawrence fellow). The story, ‘Scorched Earth” features a new, comic-exclusive villain in the shape of Blitz and a free-for-all, hell-for-leather (etc, etc) race across the desert between Axel and a veritable rogue’s gallery of past foes, winner (survivor!) takes all! For a taster of what’s inside how the front cover’s looking, click on the two thumbnails below, and then rush to your local newsagents to purchase said item. Ready, set… go! Though the San Diego Comicon is next on this year’s round of convention appearances and signings, the next (UK) outing has now been confirmed. I’ll be appearing at the London Film and Comic Con at Earl’s Court on Saturday September 1st, along with Geoff Senior, Steve White and… Bumblebee? Yep, the Chevy Camaro from the movie will be upstaging us all. But if you want to get your copies of the new Titan Transformers comic/magazine signed, do pop along. Click on the link below for more information or visit the convention website here. 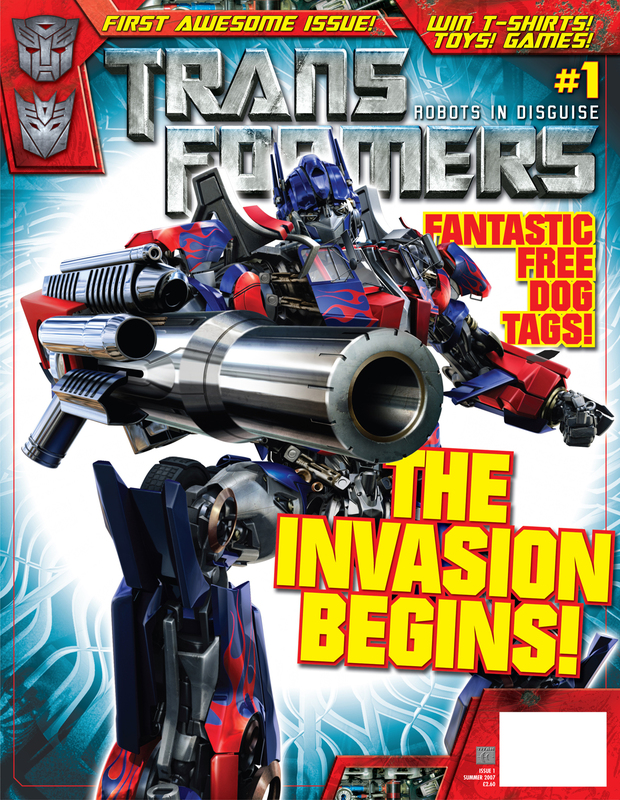 Here we go again, and this time the topic for discourse (in as spoiler-free a way as possible) is Transfomers (UK) #6. This issue wraps up the first story ‘arc’, though as I’ve mentioned before each is a self-contained, single character-led entity. Here, the focus falls on Jazz, the last of those ‘lost in space’ after events in issue #2. I had two distinct things to accomplish here: one, present a story that draws out Jazz’s unique personality (like his G1 equivalent, he’s a culture vulture and wishes to experience as much universal diversity as possible), and two, bring the Autobots together again for a rousing, all guns blazing finale. The first, main strand revolves around a planet that seems too good to be true (and, of course, is), and its parasitic like effect on Jazz, who’s decided to hang up his guns for good as the story opens. This one also features a Cybertronian flashback and a guest star or two, one of which does appear in the movie, one of which doesn’t (but is in the toy line). 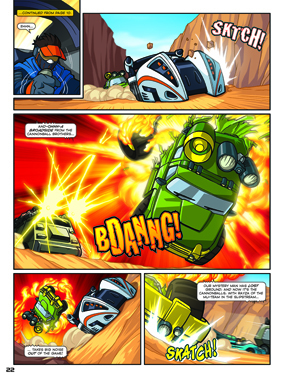 The second strand involves the efforts of Ratchet to reunite with his comrades-in-arms, but will he and Ironhide be in time to save Jazz… from himself? This won’t be out until late November/early December, but trust me, it’ll be worth the wait. No word yet on artist. Keep an eye on whatever discussion thread this blog entry engenders. Once I know more, so will you! Just a quick reminder that the first issue of Titan’s bonza new Transformers comic/magazine goes on sale this Thursday (the 19th), and features an all-new comic strip story (movie-continuity) from me and Geoff Senior. Also, TF-UK (must remember the dash) editor Steve White is appearing on Radio 1 tomorrow (19th) at 2:30PM on the Edith Bowman show, to talk all things Transformers. Click on the cover thumbnail so you know what to look for in newsagents tomorrow. You are currently browsing the simon furman blog archives for July, 2007.